When you look at your smile in the mirror, are you happy with what you see? If you’re like many Americans, you may have flaws in your smile that affects your confidence and self-esteem. 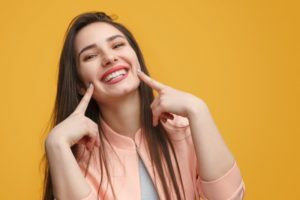 Thankfully, your cosmetic dentist in Gramercy Park offers cosmetic services that can completely transform your smile into the grin of your dreams. Keep reading to learn about some of the most popular cosmetic services and how you can benefit from them. By far the most popular cosmetic service around the holidays, teeth whitening offers patients dramatic results in a short amount of time. Patients can enjoy bright white smiles for all of their holiday photos with professional grade whitening that can be administered at home or in the dentist’s office. Your dentist may even use ozone treatment, which can boost the strength of the whitening gel while reducing your sensitivity. With teeth whitening, you can receive a dazzling smile in just one easy visit, or by using an at-home kit provided by your dentist. Do you have flaws like chips, cracks, discoloration, gaps, decay and more? Well, porcelain veneers can conceal all of them. Veneers are thin shells of dental porcelain that cover the front surfaces of your teeth. You can pick the size, shape, and color of your veneers to achieve the exact smile of your dreams. The best part is that dental porcelain is stain-proof, so you won’t have to worry about daily coffee or wine causing discoloration in your new smile. Made of composite resin, tooth colored fillings bring your smile a ton of benefits compared to traditional fillings. Especially if you have decay in a visible area of your smile, tooth colored fillings can preserve your natural tooth structure, while restoring the parts that need it to deliver you a beautiful smile. Blurring the line between cosmetic and restorative dentistry, all-ceramic dental restorations give you long-lasting health benefits and help your teeth look great. Whether you need a crown, bridge, inlay, or onlay, these restorations will preserve and strengthen your natural tooth that can be weakened over time. Additionally, if you are allergic or sensitive to metals, all-ceramic restorations offer you a solution without causing any discomfort. Does it sound like you could benefit from any of these cosmetic services? Contact your local dentist to get started on your brand-new smile. Dr. Ira Newman is a New York Native who was raised in Queens. He enjoys providing quality care to the patients in his community. He has appeared on various new networks like CNN and CBS News to discuss modern dental technologies and how they help his patients. He currently practices at Gramercy Dental Studio, and he can be contacted through his website or by phone at (212) 924-6890 for any questions.